Pressure ulcers (PrUs) occur in soft tissues subjected to pressure. These soft tissues include tissues beneath medical devices used for monitoring or treatment. Medical device-related pressure ulcers (MDR PrUs) are becoming increasingly common in all settings and in all age groups and are often reported to various US state health departments and the National Database of Nursing Quality Indicators, revealing their incidence and seriousness.1 These ulcers can be more complicated than preventing usual PrUs because the device may be an essential diagnostic/therapeutic component of treatment. This review paper addresses the issues of PrUs beneath medical devices, presents options for prevention, and discusses a quality improvement (QI) project on MDR PrUs. 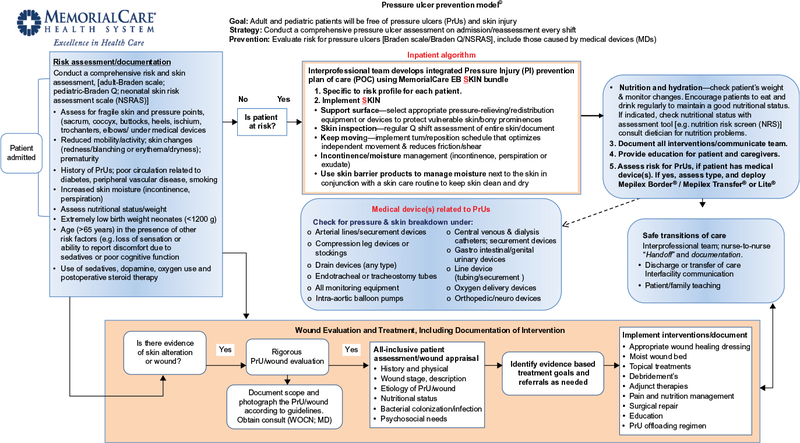 PrUs related to the use of medical devices are areas of localized injury to the skin or underlying tissue as a result of sustained pressure from a device2 (Figure 1). The soft tissue injury usually mimics the shape of the device, which is often rigid or secured with tight dressings. These PrUs can evolve into full-thickness PrUs due to the lack of adipose tissue in many of the areas of ulceration. Figure 1 PrUs from the aspiration port and the balloon inflation port of an indwelling urinary catheter. The frequency of ulceration varies by the type of device. 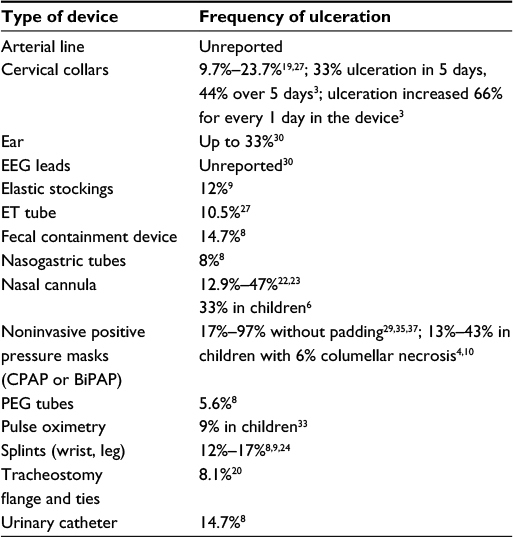 Table 1 lists the ranges of incidence of PrUs by the medical devices. 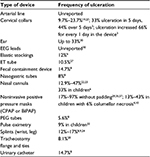 Devices for oxygen delivery and airway management have the highest reported PrUs (Figure 2). The priority placed on the airway often leads to tight securements, leading to ulcers from the securement device (eg, lip ulcers from tape to secure the ET tube), a tight device to maintain a seal (eg, facial ulcers from noninvasive positive pressure ventilation [NIPPV]), or tightening the tubing to prevent dislodgement (eg, tightening up the nasal cannula, leading to ulcers on the ears or face). Jatana et al10 reported that 13% of children with NIPPV develop ulcers and 6% of them develop necrosis of the columella. Abbreviations: EEG, electroencephalography; ET, endotracheal; CPAP, continuous positive airway pressure; BiPAP, bi-level positive airway pressure; PEG, percutaneous endoscopic gastrostomy. 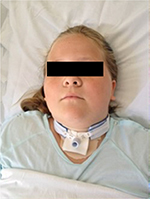 Figure 2 PrU from the securement straps around the neck in a patient with a tracheostomy. MDR PrUs should be differentiated from immobility-related hospital-acquired pressure ulcers (HAPUs) by examining the location of the HAPU; immobility-related HAPUs frequently occur over a bony prominence or tissue exposed to pressure from a support surface, and MDR HAPUs often mirror the shape and location of a medical device. Common risk factors for both HAPU categories included immobility, inactivity, sensory deficits, moisture, friction, shear, nutritional deficiencies, and/or poor oxygenation. A unique aspect of MDR PrUs is a rigid plastic material used to construct several medical devices as the source of the external pressure. For example, devices for monitoring (arterial lines), prevention (heel off-loading devices), or treatment (continuous positive airway pressure masks, tracheostomy flange) often contain, in whole or in part, a hard plastic material. These materials exert pressure on the skin and lead to ulceration. Oxygen tubing has been recognized as a culprit in device ulcers for some time. A paper in 1972 called these ulcers a “bedsore of the ear”.11 Some devices require securement to assure that they are not dislodged. Due to the securement, these devices seldom move, so shear forces are a less likely etiology. However, the securement straps or dressings can also exert pressure forces on the skin. Goodell performed an in vitro quantification of the pressure applied to the ear lobe by a pulse oximetry device and reported that 20.7 mmHg pressure was applied to the lobe. This pressure was 0.24 pounds of force exerted over 0.3 square inches.12 This study does not show causality; however, it bears light on the intensity of pressure from some devices (Figure 3). 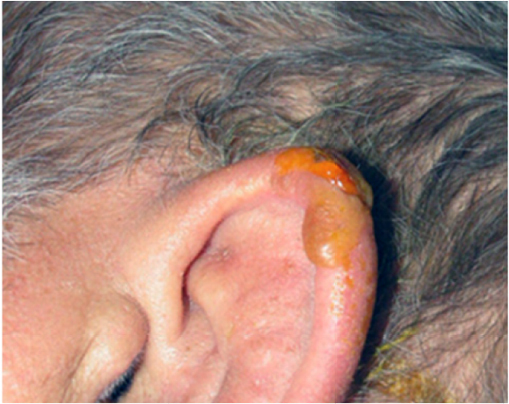 Figure 3 PrU on the ear from an oxygen saturation probe. Patients with inflammatory diseases who develop edema from fluid resuscitation or inflammation can be injured from devices that become too tight. These issues are aggravated by inappropriate sizes or selections of products; when elastic stockings are applied that are too small, the patient may roll the stocking down to relieve pressure in the thigh. Microclimate (heat and humidity at the skin–device interface) also increases the risk of ulceration by creating maceration of skin and decreased tolerance of pressure. Each of the many medical devices has unique aspects to the risks of ulceration and prevention plans. Any prevention plan must begin with obtaining the correct size of the medical devices such as elastic stockings and heel off-loading devices. One-size-fits-all does not apply here. Prevention plans must be comprehensive.16,17 These are presented in Table 2. Instituting measures to prevent harm from medical devices is paramount. Clinicians should be familiar with the medical devices that have been problematic in their health care system. 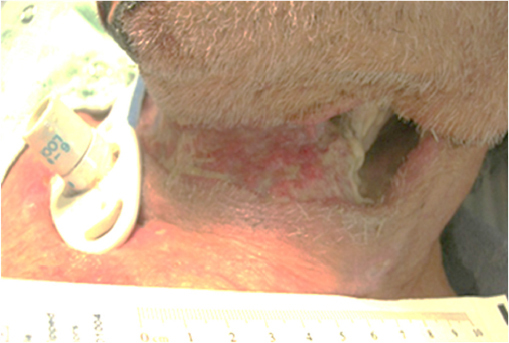 Clinicians should be familiar with best practices that prevent MDR HAPUs for every medical device in use in their health care institution.18 Ulceration of the face and occiput from a neck collar is often due to fear of injury to the cervical spine if the collar is loosened and the patient moves his head.19 Ulcers within tracheostomy stoma and beneath securement straps behind the neck need to be addressed by nurses and respiratory therapists. Using bundled interventions worked best.20 Ulcers from oxygen tubing were noted in patients who were not using oxygen prior to hospitalization.21 Ulceration of the heel and leg from elastic stockings, splints, or heel off-loading devices can occur when these devices are used in patients with compromised circulation. Deep tissue injury ulcers can develop quickly in these patients. Obese individuals are also at risk because tubes and medical devices can become compressed and hidden by large or deep skin folds. Abbreviations: EEG, electroencephalography; NT, nasotracheal tube; ET, endotracheal; PrUs, pressure ulcers; CPAP, continuous positive airway pressure; BiPAP, bi-level positive airway pressure; PEG, percutaneous endoscopic gastrostomy; MD, medical devices; RT, respiratory therapist. Examining the skin is a crucial component of prevention, for example, changing the location or repositioning the device at routine intervals if possible. In one large study, >74% of MDR PrUs were not identified until they were stage 3, 4, or unstageable. They also found that 63% of cases had no documentation of skin inspection, device removal, or pressure relief.9 Because many devices are on critically ill patients, examining the skin during the hand-off from nursing shift to nursing shift is an excellent way to have adequate help to hold the patient and examine the skin. The National Pressure Ulcer Advisory Panel created teaching posters on medical device ulcers. They can be found at npuap.org. In 2012–13, a western US hospital had reduced the incidence of traditional PrUs on the sacrum, coccyx, and heel from 5.9% to 0.1% using an evidence-based (EB) SKIN (Support surface, Keep the patient moving, Incontinence management, Nutritional support) bundle22 including a five-layered foam-bordered dressing (Mepilex® Border Sacrum by Mölnlycke). Thus, the number of MDR PrUs became much more transparent. Using the Plan-Do-Study-Act model, an actionable plan to sustain improvement was developed. The first step was a small test of change, and preventive dressings were placed beneath all tracheostomy plates and other respiratory devices, particularly in the Neonatal Intensive Care Unit and Pediatric Intensive Care Unit (PICU). Results were apparent, and the ulcer rate decreased. So, an interdisciplinary team (Pediatric Clinical Nurse Specialist; Director of Nursing Research, Registered Nurses, Medical Doctors, Physical Therapist, and Wound Program Director) was developed to design a broader performance improvement process. This team conducted a root cause analysis on the MDR PrUs (N=21). Using data on the location, the specific device involved, and compliance with existing SKIN bundle, a fact sheet was developed to aid in identification of these ulcers. EB interventions including frequent skin and device assessments, reducing the moisture interface, and padding the skin were included. 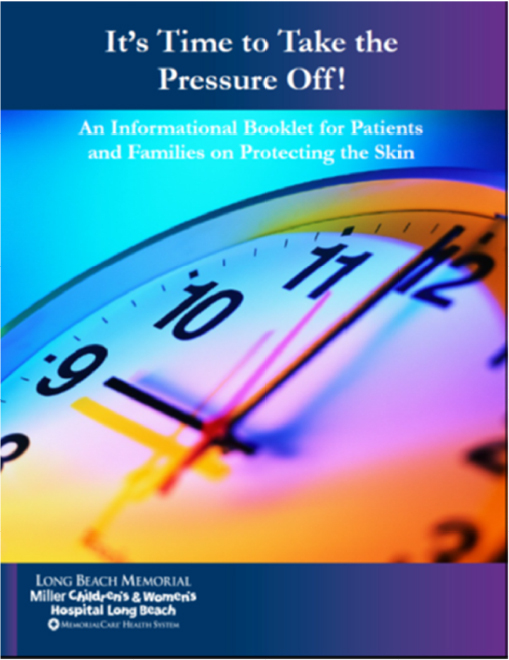 To improve compliance, Long Beach Memorial Miller Children’s & Women’s Hospital developed an interdisciplinary “Skin Surveillance Team” to review and discuss patients who are at high risk for skin breakdown. The team met every Tuesday and Thursday in General Pediatrics and on Monday and Thursday in Adult intensive care units. Patient and family education was also provided about preventive measures for the skin during the hospitalization and at home. A booklet was developed for the patient and family to explain how ulcers form and their role in prevention (Figure 4). Figure 4 Patient information booklet cover on PrUs. Figure 5 Model developed for the reduction of HAPUs. Abbreviations: HAPU, hospital-acquired pressure ulcer; NSRAS, neonatal skin risk assessment scale; WOCN, wound, ostomy, continence nurse; MD, Medical Doctor; LB, Long Beach; EB, evidence-based. Patient whiteboards to improve patient-centered communication, highlighting safety risks (PrUs; falls). Figure 6 The use of thin dressings beneath a tracheostomy to reduce PrUs. 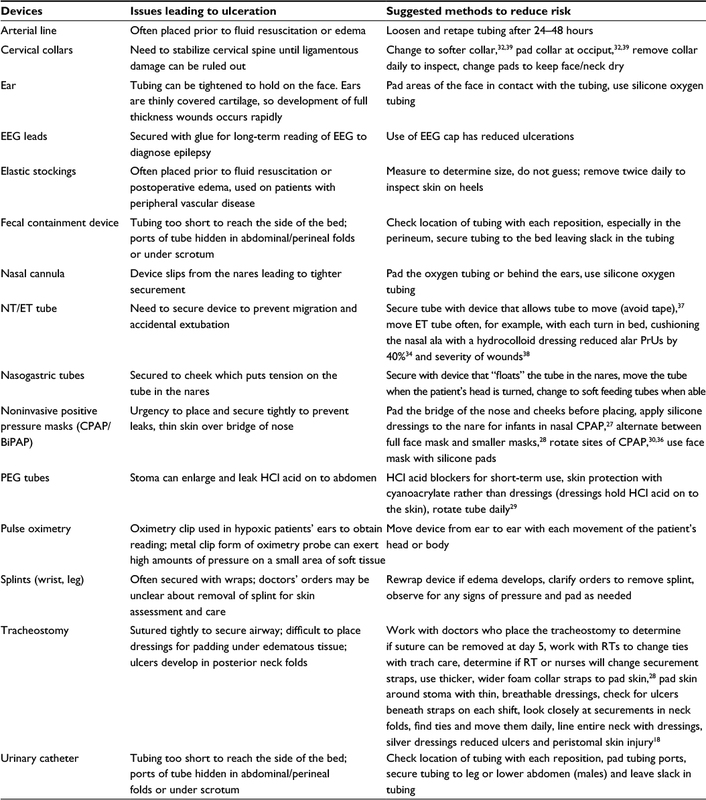 Although the pressure mechanism of soft tissue injury and staging is similar for immobility-related and device-related PrUs, risk assessment and the focus of prevention and management are different. Some simple interventions, such as padding high-risk areas, will reduce the intensity of the pressure. It is imperative that the skin be examined for early signs of pressure and that devices are chosen to fit the patient’s body habitus. Joyce M Black serves as a consultant to Molnlycke Health Care. The authors report no other conflicts of interest in this work. Bergquist-Beringer S, Gajewski BJ, Davidson J. Pressure ulcer prevalence and incidence: report from the National Database of Nursing Quality Indicators® (NDNQI). In: Pieper B, with the National Pressure Ulcer Advisory Panel (NPUAP), editor. Pressure Ulcers: Prevalence, Incidence, and Implications for the Future. 2nd ed. Washington, DC: National Pressure Ulcer Advisory Panel (NPUAP); 2012:175–187. Black JM, Cuddigan JE, Walko MA, Didier LA, Lander MJ, Kelpe MR. Medical device related pressure ulcers in hospitalized patients. Int Wound J. 2010;7(5):358–365. Davis JW, Parks SN, Detlefs CL, Williams GG, Williams JL, Smith RW. Clearing the cervical spine in obtunded patients: the use of dynamic fluoroscopy. J Trauma. 1995;39(3):435–438. Curley MA, Quigley SM, Lin M. Pressure ulcers in pediatric intensive care: incidence and associated factors. Pediatr Crit Care Med. 2003;4(3):284–290. Fischer C, Bertelle V, Hohlfeld J, Forcada-Guex M, Stadelmann-Diaw C, Tolsa JF. Nasal trauma due to continuous positive airway pressure in neonates. Arch Dis Child Fetal Neonatal Ed. 2010;95(6):F447–F451. Murray JS, Noonan C, Quigley S, Curley MA. 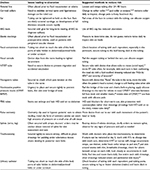 Medical device-related hospital-acquired pressure ulcers in children: an integrative review. J Pediatr Nurs. 2013;28(6):585–595. VanGilder C, Amlung S, Harrison P, Meyer S. Results of the 2008–2009 International Pressure Ulcer Prevalence Survey and a 3-year, acute care, unit-specific analysis. Ostomy Wound Manage. 2009;55(11):39–45. Ayer M, Borchert K, Arnold-Long M. Device Related Hospital Acquired Pressure Ulcers in Long Term Acute Care Hospitals. WOCN Conference; 2011; New Orleans, LA. Apold J, Rudrych D. Preventing device-related pressure ulcers: using data to guide statewide change. J Nurs Care Qual. 2012;27(1):28–34. Jatana KR, Oplatek A, Stein M, Phillips G, Kang DR, Elmaraghy CA. Effects of nasal continuous positive airway pressure and cannula use in the neonatal intensive care unit setting. Arch Otolaryngol Head Neck Surg. 2010;136(3):287–291. Gilston A. Bedsore of the ear. Lancet. 1972;16(2):1313. Goodell T. An in vitro quantification of pressures exerted by earlobe pulse oximeter problems following reports of device-related pressure ulcers in ICU patients. Ostomy Wound Manage. 2012;58(11):30–34. National Pressure Ulcer Advisory Panel (NPUAP). European Pressure Ulcer Advisory Panel (EPUAP), and Pan Pacific Pressure Injury Alliance (PPPIA). Prevention and Treatment of Pressure Ulcers: Clinical Practice Guideline. In: Haesler E, editor. Cambridge Media: Osborne Park, Western Australia; 2014. Mucosal Pressure Ulcers: An NPUAP Position Statement. National Pressure Ulcer Advisory Panel. Washington DC; 2008. Pressure Ulcers with Exposed Cartilage Are Stage IV Pressure Ulcers. National Pressure Ulcer Advisory Panel; 2012. Dyer A. Ten top tips: preventing device-related pressure ulcers. Wounds Int. 2015;6(1):9–13. Fletcher J. Device related pressure ulcers made easy. Wounds UK. 2012;8(2):1–4. Samaniego I. A sore spot in pediatrics: risk factors for pressure ulcers. Dermatol Nurs. 2004;15:153–159. Ackland HM, Cooper DJ, Malham GM, Kossmann T. Factors predicting cervical collar-related decubitus ulceration in major trauma patients. Spine. 2007;32(4):423–428. Boesch RP, Myers C, Garrett T, et al. Prevention of tracheostomy-related pressure ulcers in children. Pediatrics. 2012;129(3):e792–e797. Turjanica MA, Clark L, Martini C, Miller P, Turner B, Jones S. Incidence, correlates and interventions used for pressure ulcers of the ear. MedSurg Nurs. 2011;20(5):241–247. Kuo CY, Wootten CT, Tylor DA, Werkhaven JA, Huffman KF, Goudy SL. Prevention of pressure ulcers after pediatric tracheotomy using a Mepilex Ag dressing. Laryngoscope. 2013;123(12):3201–3205. Weng MH. The effect of protective treatment in reducing pressure ulcers for non-invasive ventilation patients. Intensive Crit Care Nurs. 2008;24(5):295–299. Gibbons W, Shanks HT, Kleinhelter P, Jones P. Eliminating facility-acquired pressure ulcers at Ascension Health. Jt Comm J Qual Patient Saf. 2006;32:488–496. Visscher M, King A, Nie AM, et al. A quality-improvement collaborative project to reduce pressure ulcers in PICUs. Pediatrics. 2013;131(6):e1950–e1960. Coyer F, Gardner A, Doubrovsky A, et al. 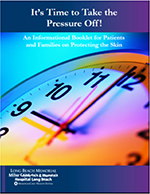 Reducing pressure injuries in critically ill patients by using a patient skin integrity care bundle (InSPiRE). Am J Crit Care. 2015;24(3):199–209. Watts D, Abrahams E, MacMillan C, et al. Insult after injury: pressure ulcers in trauma patients. Orthop Nurs. 1998;17(4):84–91. Jaul E. A prospective pilot study of atypical pressure ulcer presentation in a skilled geriatric nursing unit. Ostomy Wound Manage. 2011;57(2):49–54. Jones DJ, Braid GM, Wedzicha JA. Nasal masks for domiciliary positive pressure ventilation: patient usage and complications. Thorax. 1994;49(8):811–812. Groeneveld A, Anderson M, Allen S, et al. The prevalence of pressure ulcers in a tertiary care pediatric and adult hospital. J Wound Ostomy Continence Nurs. 2004;31(3):108–120. Coyer FM, Stotts, NA, Blackman VS. A prospective window into medical device-related pressure ulcers in intensive care. Int Wound J. 2014;11:656–664. Powers J, Daniels D, McGuire C, Hilbish C. The incidence of skin breakdown associated with use of cervical collars. J Trauma Nurs. 2006;13(4):198–200. Noonan C, Quigley S, Curley M. Skin integrity in hospitalized infants and children: a prevalence survey. J Pediatr Nurs. 2006;21(6):445–453. Günlemez A, Isken T, Gökalp AS, Türker G. Effect of silicone gel sheeting in nasal injury associated with nasal CPAP in preterm infants. Indian Pediatr. 2010;47(3):265–267. Lemyze M, Mallat O, Nigeon O, et al. Rescue therapy by switching to total face mask after failure face make-delivered noninvasive ventilation in do-not-intubate patients in acute respiratory failure. Crit Care Med. 2013;41(2):481–488. Newman K, McGrath J, Salyer J, Estes T, Jallo N, Bass T. A comparative effectiveness study of continuous positive airway pressure-related skin breakdown when using different nasal interfaces in the extremely low birth weight neonate. Appl Nurs Res. 2015;28(1):36–41. Zaratkiewicz S, Teegardin C, Whitney JD. Retrospective review of the reduction of oral pressure ulcers in mechanically ventilated patients: a change in practice. Crit Care Nurs Q. 2012;35(3):247–254. Huang TT, Tseng CE, Lee TM, Yeh JY, Lai YY. Preventing pressure sores of the nasal ala after nasotracheal intubation: from animal model to clinical application. J Oral Maxillofac Surg. 2009;67(3):543–551. Jacobson R, Tescher A, Miers A, Downer L. Improving practice: efforts to reduce occipital pressure ulcers. J Nurs Care Qual. 2008;23(3):283–288.